Embark on a winter escape to three of the Canadian Rockies' spectacular resort towns—Whistler, Jasper and Banff—on this well-planned 10-day vacation. Book a qualifying winter rail vacation of $1,000 or more per person and save $150 per couple. Mention promo code: Winter1920. Valid for qualifying USA, Canada, and Switzerland vacations of $1,000 or more per person made by June 28, 2019 for travel between October 3, 2019 to April 30, 2020. Offer does not apply to Canadian Rockies Winter Adventure or Quebec Winter Carnival. Offer is non-transferable and has no cash value. Offer is subject to change and may be withdrawn at any time. Additional terms and conditions may apply. If there was ever a place to surround yourself with the majesty of nature and the serene beauty of winter it is the Canadian Rockies. Lucky for you, you will have 10 days to take it all in on this wintertime adventure. Your time in the Rockies begins as you fly into Vancouver and are transferred to the resort town of Whistler. Here, you will enjoy spa amenities and cold-weather activities before moving back to Vancouver for sightseeing, incredible restaurants and great culture. Also in Vancouver, you will board VIA Rail’s Canadian for an overnight journey to Jasper. Upon arrival in Jasper, winter tours and sports and planned adventures, such as a walk through the icy floors of Maligne Canyon, create memories to last a lifetime. The final stop on this tour takes you to Banff - another beloved resort town that is surrounded by a beautiful national park. 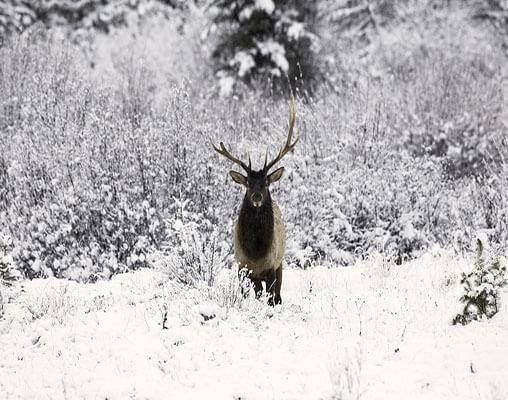 Your guided tour will reveal some of the park’s best sights, as well as the wildlife that makes its home in this snow-covered natural paradise. Experiencing winter in the Rockies has never been more enjoyable. This itinerary is also available from Calgary to Vancouver based on your travel preference. Arrive in Vancouver today and from the airport, you will be transferred to the beautiful mountain resort town of Whistler. As one of the largest ski resorts in North America, this town is a hub for winter sports and activities. Check into your hotel upon arrival, and then take some time to start exploring this snow-clad wonderland. Overnight Whistler. Whistler has so much to offer winter visitors: skiing, snowboarding, ice skating, tubing, sleigh rides, dog sledding, walks through the snow and so much more. More adventurous visitors can try heli-skiing, bungee jumping and ziplining. The options are truly limitless! You will have the whole day to indulge in whichever activity appeals to you the most. Do not miss one of the town’s most enticing attractions, the PEAK 2 PEAK Gondola, which offers a view of the beautiful mountain town from above. With wonderful restaurants, great shopping opportunities and relaxing spas, Whistler truly has something for everyone. Overnight Whistler. Awaken all of your senses with a visit to the Scandinave Spa in Whistler. Scandinavian baths and hydrotherapy are recognized for their energizing and relaxing effects. Reinvigorate your mind and body. Your spa pass provides access to body warming rooms, rinsing stations and relaxation areas. Overnight Whistler. 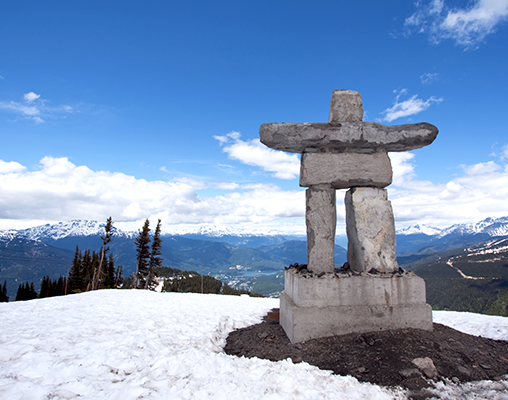 Today, a coach will take you from Whistler to the coastal city of Vancouver. Upon check-in, you will have the rest of the day to familiarize yourself with this beautiful coastal city, which is known for its scenery almost as equally as its diverse culture. 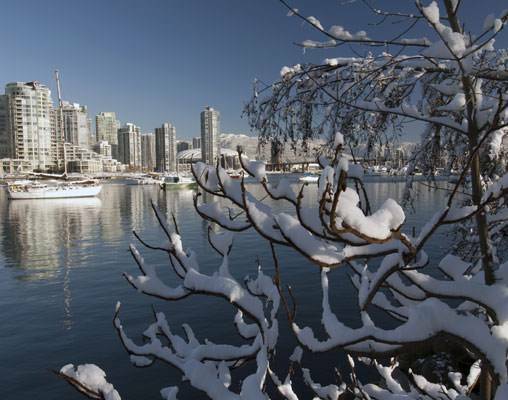 There are museums and art galleries to be explored, a train ride through Stanley Park, an Ice Rink in Robson Square and plenty of opportunities for tobogganing, snowshoeing and other winter sporting activities. Overnight Vancouver. The morning is at leisure to sleep in or enjoy a meal on your own. You will then transfer to Vancouver’s train station to board VIA Rail's Canadian. Settle into your onboard accommodations for the overnight journey east to another scenic mountain town, Jasper. Overnight train. Take a look at the stunning peaks of the Canadian Rockies from one of the lounges and chat with your fellow travelers as you move through the mountains to your destination. As your train arrives this morning, you will transfer independently to your centrally located hotel. Jasper National Park is one of the most photographed locations in Canada, and you will see why as you spend the remainder of the day exploring at your leisure. Overnight Jasper. 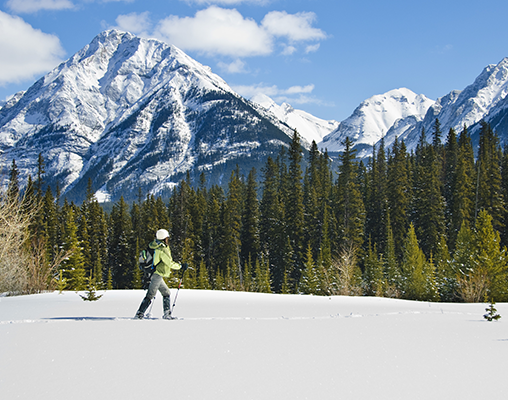 Travel into the deepest canyon in Jasper National Park today, and take a walk on the frozen floor! 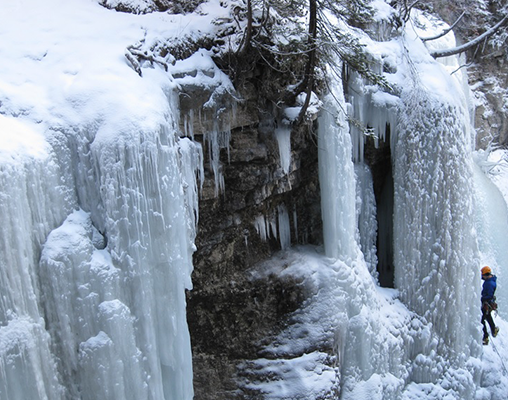 This sightseeing adventure takes you into Maligne Canyon where you will see frozen waterfalls, including the most famous, the Queen of Maligne and Angel Icefalls, and amazing ice formations. While there, you will hear the tale of disappearing Medicine Lake and walk approximately 2 miles into the canyon and back. The remainder of the day will be yours to enjoy the winter offerings of the town. Overnight Jasper. 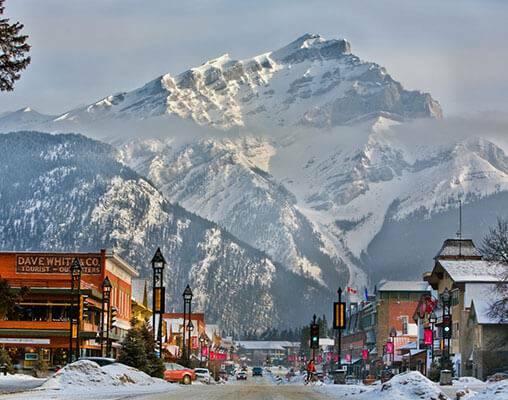 A coach will take you from Jasper to Banff, another beloved mountain town within the Canadian Rockies, today. When you arrive, you will have the rest of the day to enjoy the town’s sights and scenery. Overnight Banff. 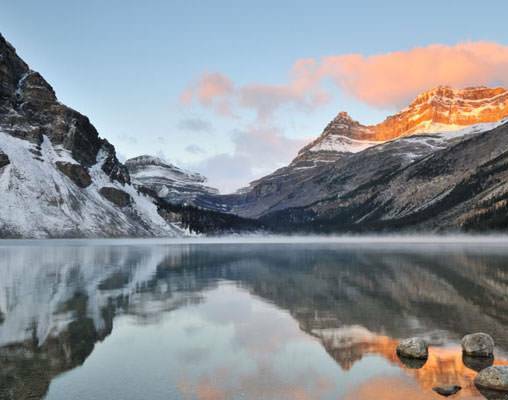 Enjoy a morning sightseeing tour of Banff and the surrounding national park. As you visit the area’s most famous landmarks, keep your eyes peeled for wildlife. You will see many species in their natural habitats, and your guide will teach you about their behavior and winter survival adaptations. Moving through the sites, you will also hear the colorful history of the Bow Valley. Following the tour, you will be free to shop downtown, take part in the area’s winter activities or to relax at your hotel. Overnight Banff. Your time on this winter adventure through Canada comes to a close today. You will be transferred from Banff to Calgary International Airport where you can return home or extend your journey by flying to one of Canada’s other popular cities. Hotels include the Coast Blackcomb Suites at Whistler, Fairmont Hotel Vancouver, Sawridge Inn & Conference Center, and Banff Ptarmigan Inn. VIA Rail accommodations in Sleeper Plus class in a private cabin. Meals are included aboard the train along with exclusive access to lounges and observation cars. Click here to view testimonials for Winter in Whistler, Jasper & Banff. The trip was well planned, the venues were great and the trip went according to schedule. Thanks team of Vacations by Rail for taking care of my booking along the entire tour. I ended very pleased with the services and all the attractions included on my package. Enter your details below if you would like to be notified when 2021 dates and prices are available for Winter in Whistler, Jasper & Banff. All accommodations in Kamloops are of moderate standard. Hotel and Rail accommodations listed above, are subject to change based on availability at the time of booking. Prices are land-only, per person based on double occupancy. Prices are correct at the time this web page is published; however, are subject to change. Taxes are not included on rail portions and are subject to change. Minimum 7-night stay required in Whistler for departures December 19, 2019 through December 30, 2019. Cabins purchased on VIA rail for a single traveler are Cabins for 1. For upgrade options, ask your rail specialist for details.